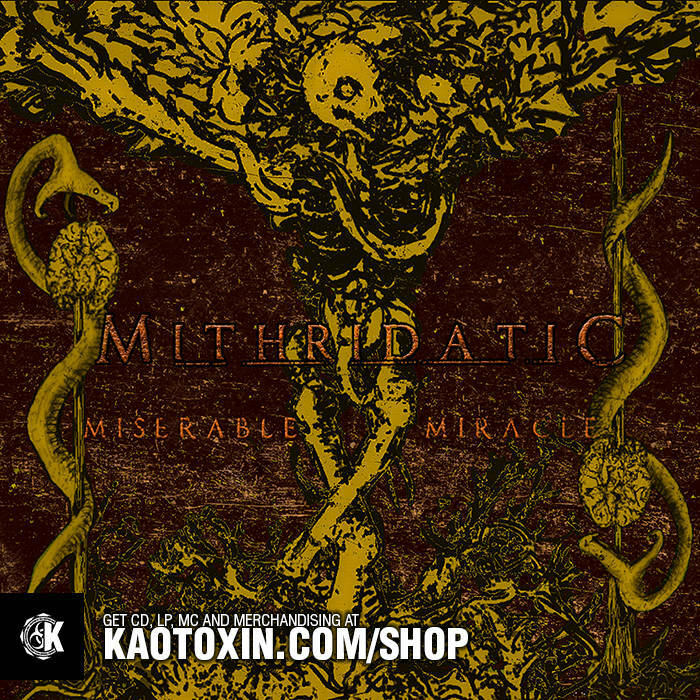 This is the début album from French Blackened Death Metallers Mithridatic. Boasting a heavy and dirty sound that immediately puts me in mind of Arkhon Infaustus’ Blackened Death Metal classic Filth Catalyst, Mithridatic reveal themselves to be a similar proposition, albeit one with its own blackened charms, of course. The songs are extremely satisfying and have that fine ratio balanced just about right between Black Metal and Death Metal influences. As such, these songs are both brutal and grim, providing the listener with some of the strongest Blackened Death Metal currently out there, in my humble opinion. Mithridatic have obviously taken their time with these songs. They’re well-composed, well-structured and have just enough variation to keep things interesting without losing their sense of direction. Blackened riffs, fluid guitar solos, darkened melodies, moody malevolence, brutal assaults and blasting mayhem are all used effectively during these tracks. High screams and growling shouts form the bedrock of the vocals. The singer has a certain quality to his voice that allows him to have instant charisma, putting me in mind of Morbid Angel on occasion, (whose influence also extends to aspects of the music). A very impressive achievement. For me, Blackened Death Metal is a style that is all too easy to do poorly, but when it’s done right it really gets the hairs standing on end. This is one such release; not only due to the atmosphere the band create, but also due to the quality and personality of the songs themselves. A mix of Arkhon Infaustus, Morbid Angel and a touch of Akercocke? Sign me up. Go check this one out immediately. This entry was posted in Death Metal and tagged Akercocke, Arkhon Infaustus, Black metal, Blackened Death Metal, Death Metal, Metal, Mithridatic, Morbid Angel. Bookmark the permalink.